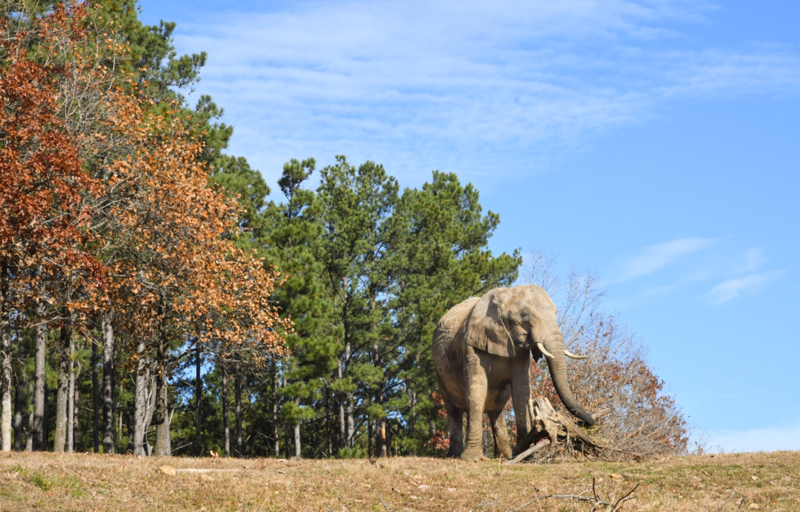 What fun it has been for Care Staff to watch Nosey develop natural elephant behaviors as she continues to explore her Sanctuary habitat. This winter, staff report Nosey has dug two deep mud holes on her own and is pushing down lots of trees... they say she is growing in confidence and beginning to work on pushing down the bigger trees. Everyone eagerly waits for end of day when they know Nosey will appear behind the barn with a new souvenir from the day’s adventures...it is most often a large log or piece of bark. She shows off a bit by tossing the logs around and hoisting them high in the air, propped on her tusks. Sometimes she playfully drops them on her back and spins underneath while kicking her legs. She strips off the bark to make long ribbons that she tosses around and throws on her back. Staff remember that on arrival Nosey didn’t appear to know about stripping the bark from a log and always chose the smallest twigs to chew on. It is exciting to see her interacting with her surroundings and exhibiting natural elephant behaviors.